I recently heard a quote from somebody (thanks, Tanja!) that in every project 1/4 of the money and energy invested in the project should be used to celebrate together. I think that is so true! In the Finnish culture celebration is easily undervalued: we don’t even have a really good word for it. A celebration can be a party or a carnival, but it can also be any kind of a gathering or ritual that values the work done and the people involved. In a celebration we are together, equal and sharing a mutual satisfaction in our community and what was experienced. A celebration turns inward, toward the center, a party turns outward, showing off. Celebrations create social value and strenghten communities, and make people happy! A harvest party is of course double important since it also the time to thank the abundance of the earth as well as for human people’s efforts. Being an urban gardener it does sound a bit dodgy to say: thank you Mother Earth. Should I say thank you Sister City instead? 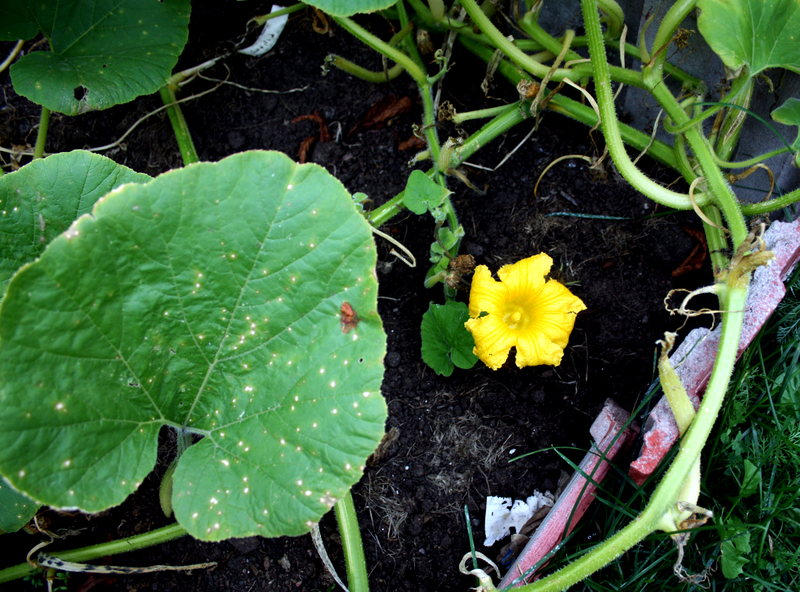 But I guess whether rural or urban, it is the same life – force manifesting itself in the beautiful vegetables. 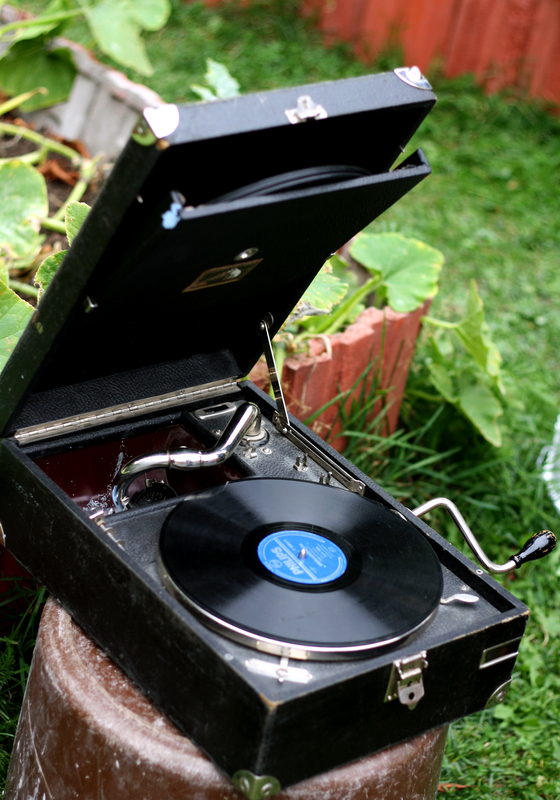 There was a harvest party at the urban garden of Vallila, with grammophone – music, a fleamarket and of course pumpkin soup. A drizzling autumn rain finished the party, but there was just enough time to greet everybody and share the last of the huge marrows and pumpkins. 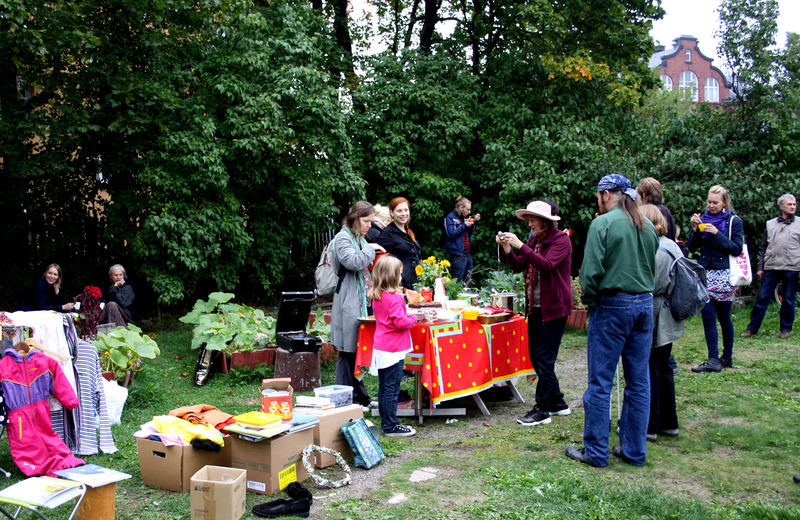 It is wonderful to start gardens on empty lots: the neighbours learn to know each other and a public space becomes meaningful, a hub of interaction between the people of the neighbourhood as well as place to grow local food in a city. Present at the party was also the Editor in Chief of the fanciest foodie magazine in Finland, Glorian ruoka ja viini, since she lives in the neighbourhood. Today, in the new issue of the magazine they nominate “urban gardening” as the Food Phenomenon of the Year, and my organisation and our projects are specially mentioned. I felt as if I’d been awarded an Oscar! Me, doing the Food Phenomenon of the year? Who would have thought? I was very happy that the culinary aspects of urban gardening are now formally recognised! Mix the ingredients for the crust quickly in a bowl. Set the crust in the fridge. Slice the apples, and grate the marzipan, and mix it with the other ingredients of the top crust. Cover a baking pan with a diameter of 24 cm with the rolled out crust, and place it in the freezer for 10 minutes. Then bake the crust in a 200°C oven for 10 minutes. 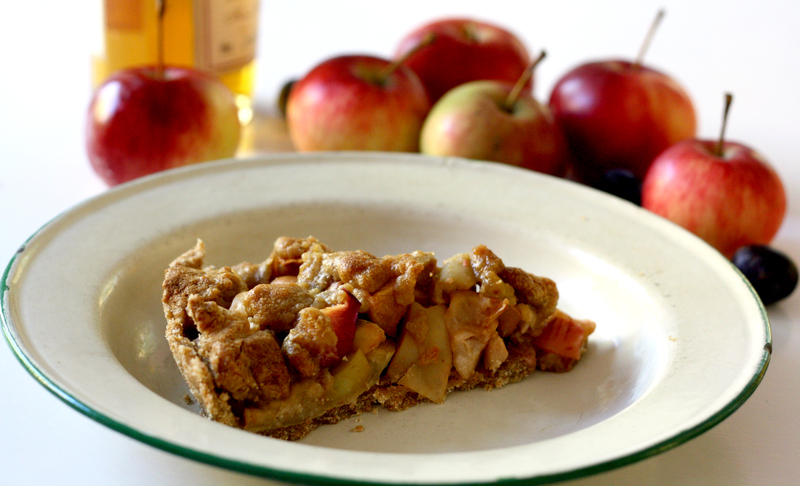 Sprinkle the crust with the apple slices, calvados and cinnamon. Crumble the top crust on top of that. Lower the temperature down to 175ºC and bake the pie in the oven 35 – 40 minutes. What to do, when both the economic and winter depression hit you hard, at the same time? Economic depression so that your employer tells you that you are now needed ten hours less in a week, and winter depression so that you only want to sleep and eat unhealthy things. But the situation is not hopeless , because then you have a good chance to invite your four-year old god child for a baking therapy session! This is what I did, and it cheered me up immensely. Baking is so therapeutic! I can easily massage any kind of worries into a dough, and as I’ve noticed, generally the doughs don’t take it ill at all, but only become fuller and more dense. So I guess a bread dough doesn’t give a damn about human worries. And also, when the finished product emerges from the oven, it makes me feel like the Ultimate Creatrix, and that’s also the reason why I call myself Goddess of Cake, not because I would be splendidly good at baking cakes… actually, with cakes I’ve had more desperate moments than with any other food that I’ve ever made. Anyway, we had a lovely afternoon, Ronja, her mother and me. 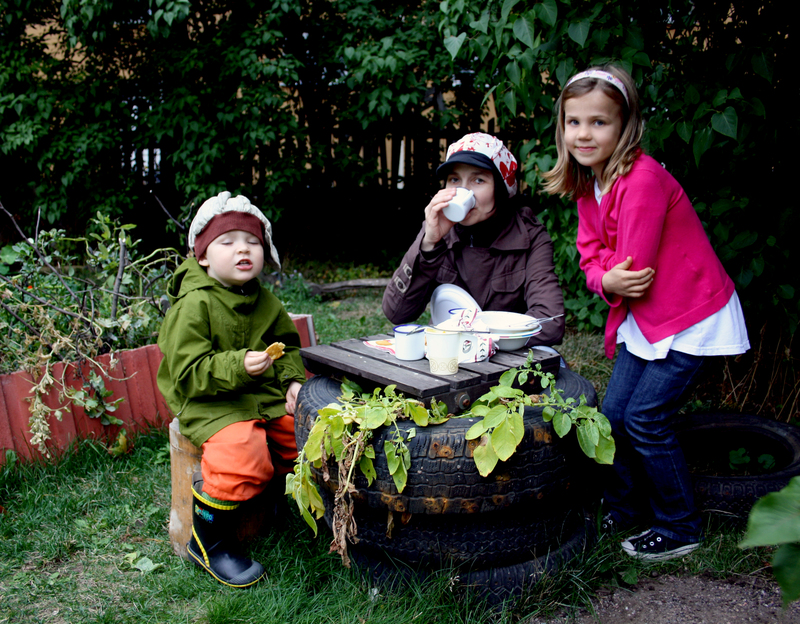 Ronja insisted on bread rolls with carrot, and me on chocolate – cashew muffins, so we baked both, ate some and took the rest to my neighbour. The bread rolls were fluffy and delicious, the muffins well risen and rich in chocolate, so supposedly they were high in all that stuff that is so good for sunlight – deprived people (tryptofan?). Since I know that you my readers are all familiar with the recipes of both carrot bread rolls and chocolate muffins, I thought to share here another baking therapy – recipe. I used to bake a lot of bread a few years ago, I guess enough to write a whole book on all my adventures in the amazing Sourdough Land. I even used to have a hundred year old rye – bread sourdough starter (leaven) that originated somewhere in Archangel, Russia, but these days it has sadly passed away in lack of TLC (though its sisters continue existence with some of my friends). – If you use yeast, don’t use it very much, but instead let your dough rise for longer time, to ensure more flavour. – Use fresh flour! If you can grind your own, do it! At least here you can get your flour ground in an organic shop. – When the dough is rising, put it to a nice warm spot and cover with a lid, not with a kitchen towel, to protect the dough from drying. – If you are not using a Kitchen Aid or other machinery to knead your dough, you are in for a work – out! Knead it until you sweat and your hands tremble, but at least for 10 minutes. The kneading very important for the density of the dough, and without it the gluten won’t work properly. – There should always be enough salt in bread dough, because it helps with the consistency a great deal. Good amount is 20g/1 kg of flour. This bread recipe is adapted from one of my all time favourite cook books, “Tillfällen att njuta en liten smula” by Therese Wikström from Danmark. Mix these ingredients and cover. Let stand at least 1 hour, preferably overnight. Knead the dough for 12 minutes, before adding the lingonberries, and then fold them in and let the dough rise for one and half hours, before you shape the loaves. Let the loaves rise on a baking sheet for one hour, in place that is protected from draft. Bake 30 – 40 minutes in a 200°C oven. The bread is ready when it sounds hollow when you knock the bottom.